Director Robert Rossen's brilliant character study features Paul Newman's passionate portrayal of "Fast Eddie" Felson, a hustling pool shark who drifts across the country playing in seedy pool halls and whose obsession to dethrone table legend "Minnesota Fats" (Jackie Gleason) could bring about his own downfall. Co-stars Piper Laurie, George C. Scott, Myron McCormick. 135 min. Widescreen; Soundtracks: English Dolby Digital stereo, Dolby Digital mono, French Dolby Digital mono; Subtitles: English, Spanish; audio commentary by Newman, others; "making of" documentary; theatrical trailer. 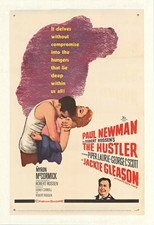 Director Robert Rossen's brilliant character study features Paul Newman's passionate portrayal of "Fast Eddie" Felson, a hustling pool shark who drifts across the country playing in seedy pool halls and whose obsession to dethrone table legend "Minnesota Fats" (Jackie Gleason) could bring about his own downfall. Co-stars Piper Laurie, George C. Scott, Myron McCormick. 135 min. Widescreen (Enhanced); Soundtracks: English Dolby Digital stereo, Dolby Digital mono, French Dolby Digital mono, Spanish Dolby Digital mono; Subtitles: English, Spanish; audio commentary by Newman, others; featurettes; "making of" documentary; photo gallery; theatrical trailers. Two-disc set.